​As you're reading this, an ​Urban Meyer rally is going on outside of Ohio Stadium. 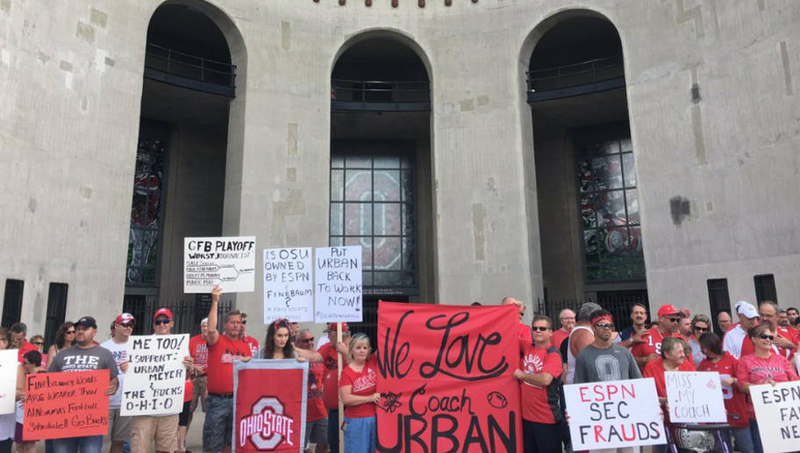 That's right, though an investigation is still under way and absolutely no one is in the know about the verdict of the scandal, Meyer supporters are pledging their love for their coach. Honestly, this is terrible and inappropriate timing. Ohio State University is in the midst of a very serious ​decision-making process, and these people feel the need to make posters? Now that I've brought it up, let's take a look at some of those posters. ​​First, let's notice the man in the red hat on the far left. His sign reads, "Me Too." That sign does not even deserve an explanation. On the far right, we have a "ESPN=Fake News" sign. Does anyone at this rally realize that Brett McMurphy, the man who reported the story, doesn't even work for ESPN? If you're going to take a stand for what you think is right, at least get the facts straight. A man by the name of 'Tennessee Jeff' is leading some sort of Urban Meyer bugle chant. And, to top it all off, pizza was delivered to the event. We kid you not, it was Papa John's. As of Monday morning, a digital petition has been circling the Internet to keep Urban Meyer from being "wrongfully fired." 23,000 signatures have been collected so far. The rally was held, according to event organizer Jeff Hamms, to show "nothing but positive words for our coach." He also said, "This has nothing to do with any of the domestic violence situation, with our coach. This is simply to lift up Urban Meyer." Easier said than done, I guess, since it seems like a fair share of the protesters did in fact make their posters about the domestic violence situation. If half of the signs actually made sense, maybe this rally wouldn't have been such an embarrassing bust. But then again, professing your support for a man recently put on ​administrative leave was never going to end well.